With preparations for Good Beer Week in full swing, I've had to abandon the reviewing every Untappd badge beer in full that I've had going for the last month. Here we have 6 beers, from 4 (5 if you count Mikkeller's involvement) different countries for your perusal. Since my medically imposed drinking break; Pirate Life Throwback IPA has become a staple in my house. It's got plenty of citrus characteristics and nice bitterness, if you didn't know - you wouldn't pick it for a mid-strength. Untappd Supporter (Level 2) is the reason you're hearing about it. Magic Rock is one of the higher profile English craft brewers. Some of their packaged stuff is making its way to our shores, after kegs made it this way last year. Their High Wire Grapefruit unlocked God Save the Queen (Level 30). It was a really impressive American Pale Ale with plenty of grapefruit and nice balanced bitterness. One of my favourite beers unlocked Hopped Up (Level 34). The beer; 8 Wired's Hopwired IPA. This is one of the best IPA's in the southern hemisphere. It's got all the big hop flavours you'd expect; pine, citrus (lime and grapefruit) and tropical fruit. It's wonderfully balance by some earthy undertones and some sweetish grains (think scones). I've spoken to a number of people who say they pass this by because it doesn't stand out on the shelves - DO NOT BE ONE OF THOSE PEOPLE! Another 8 Wired beer to unlock a badge was their (relatively) new Sour Poppy, a sour version of their Tall Poppy Red Ale. It's a really interesting beer, with some slight hop bitterness complimenting the light sourness very nicely. There was a hint of smokiness, which I found quite unusual - it was almost roasty. This is quite an interesting beer. Pucker Up (Level 31) was the badge. 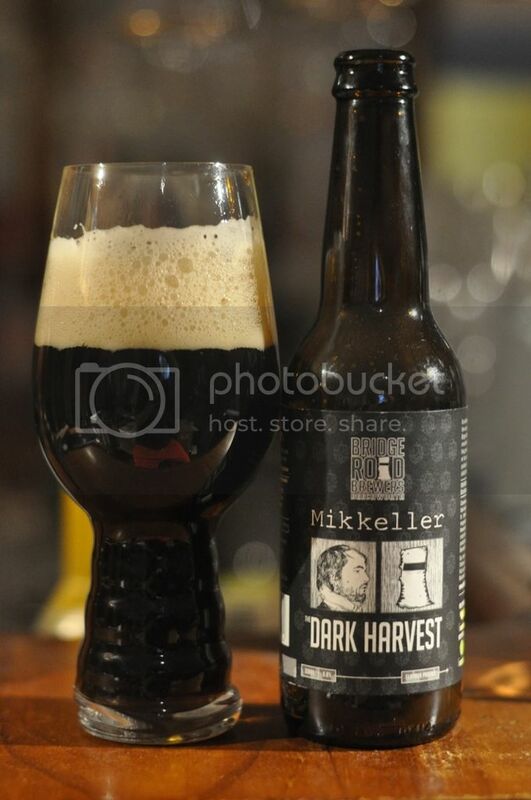 Bridge Road & Mikkeller's collaborative beer; Dark Harvest, is one of the best collaboration beers year on year. Better Together is a badge that is making my Golden Pint awards, well at least one category, that little bit easier to keep track of; this beer unlocked (Level 11). It's one of the juiciest Black IPA's on the market, with grapefruit and tropical fruit notes jumping out of the glass. There's also plenty of roast characteristics, with chocolate on the back end as it warms. I would say this is the bench mark for the style in this country - shame it only comes out once a year! The Land of the Free badge is drawing to a close for me, Lagunitas IPA unlocked (Level 49). I could've sworn I've tried this beer before, but Untappd says otherwise... In any case I thought that the beer was either a little past it's best. It was dominated by sweet malts with bitter pine hops and just a hint of citrus towards the back end. I would quite like to try this beer fresh and see if this is a true representation of what they were trying to do - if it is, it's not for me. So there we have it guys. Please let me know if any of you have tried any of these and what you thought of them. There's a couple of posts in the pipeline, with that glassware post I've been promising just awaiting some photo's - so maybe this weekend... Good Beer Week kicks off this Friday so posts may be a little sporadic for the next two weeks, although I will definitely get my GABS preview up for you in time.